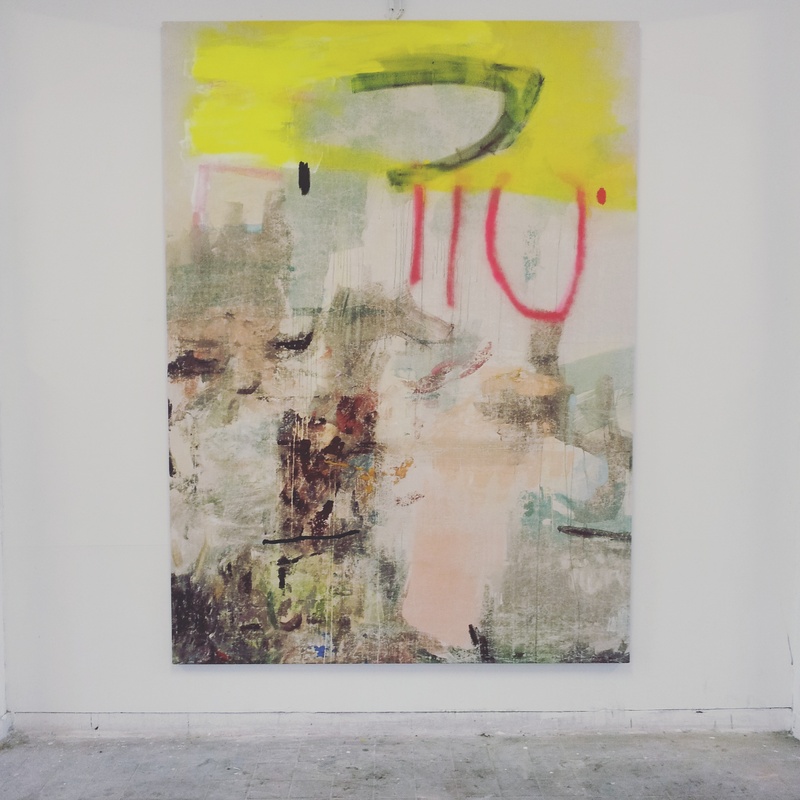 Jenny Brosinski pummels her viewer into a state of emotional resonance with intoxicating pinks and lightning yellows dichotomously painted over a surface of raw, faded canvas. 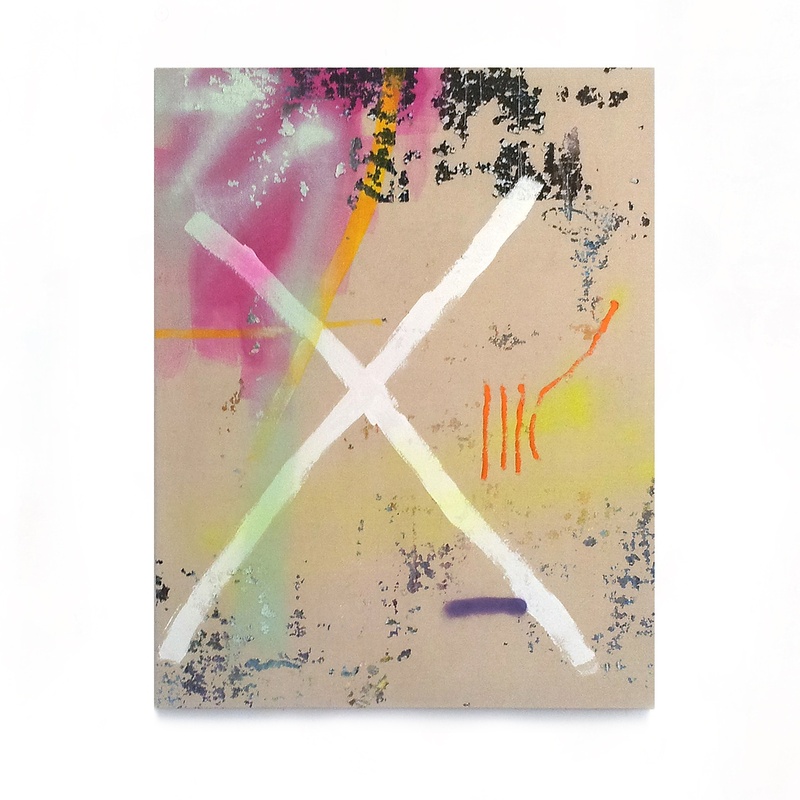 Building on sensual marks and spray painted poofs, Brosinski layers her paintings by bringing them to her laundromat where, in a post-Cagean play on chance, she washes and dries them to create the striking appearance of chromatic distress that dominates her work. 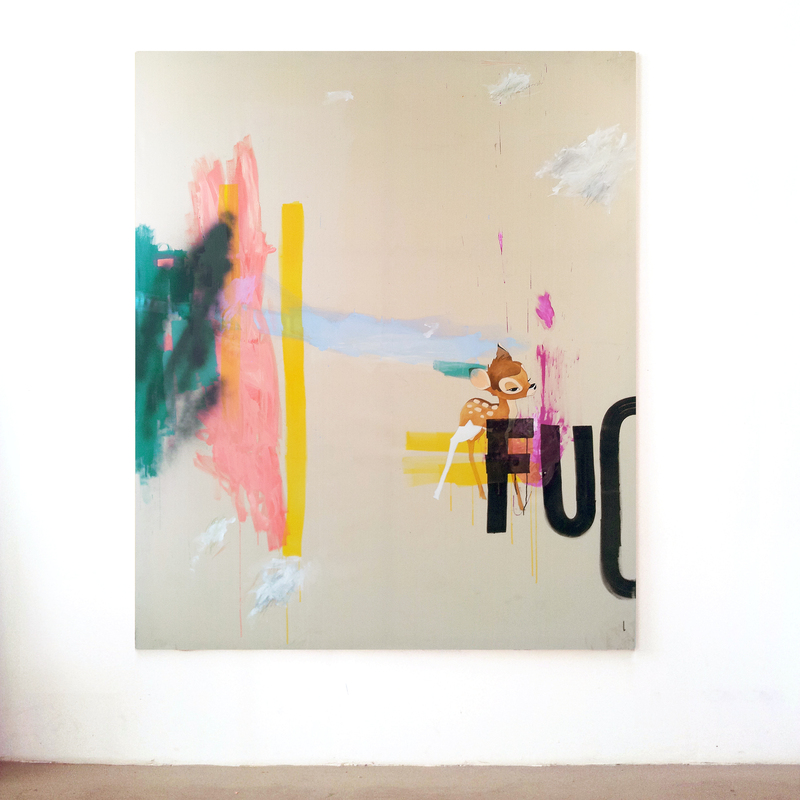 She works in a mad rush, producing six or more pieces at once in a tornado of painterly action rivaled only by the creative energy of the Berlin neighborhood where she resides. The result is an eccentric range of aesthetic sensibilities and paintings that are outfitted with magnificent personalities. Brosinski, who holds a postgraduate degree from Weißensee Academy of Art, lives and works in Berlin, Germany. 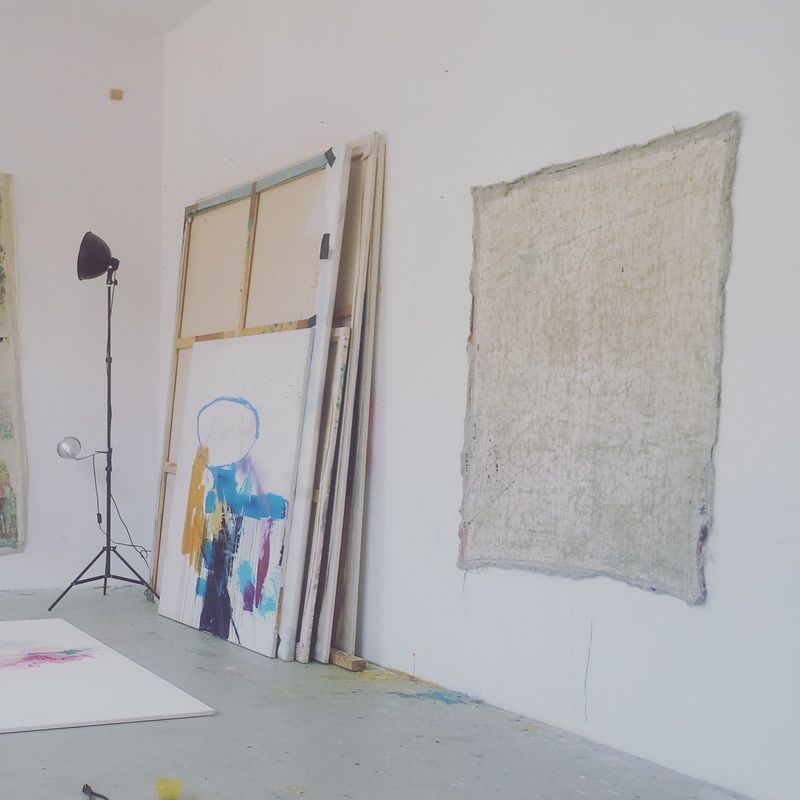 She is a 2015 recipient of Leipzig’s Pilotenküche residency and member of the 2014 Berlin Art Prize shortlist. Tell us about your studio and the way you work there. My Studio is a nice, bright place on the third floor of an old factory in Berlin-Wedding. There are many other artists on the grounds, but also many people doing totally different things. On the second floor, for example, there is a mosque. If you ask me about my studio and the way I work there, you have to know that my working method has a lot to do with contemplation, which surely applies to a great member of artists too. But often I am sitting there for hours only looking and thinking. I do that, as I remember, since I was a little girl from two years old. Steadily since that time I have been looking for a calm place with no toys or entertainment. So, as my first studio, I found the second bathroom on the first floor of my grandparents’ house, which nobody normally used during the day. Sometimes, it feels like you are here alone thinking or dreaming. I like that. Now, a few years later, I have my own studio – and I think it’s still the same (even if I have my notebook with me – just in case). I like that place where nobody will come in, disturb, or cop me. I am not the kind of artist who is painting all the time. I work in waves, doing different things at different times, and I need most of the time to look at things, to feel what they do to me – or don’t. Then I paint quickly. This is a shame because I really love painting. Often, I paint more than six paintings at the same time. I’ve noticed that your paintings are often unstretched and unprimed when you are working on them. Why do you do this? When I have “finished” my paintings, after some weeks of living together with them, I take them off the wooden stretchers and bring them to the laundromat, where I wash and tumble dry them. It’s hard to surprise yourself; perhaps this is the reason that I am not interested in celebrating myself with every brushstroke I make. That is really important for my working process. I love to destroy, to lose control, to react to something. This is the point where my paintings get unstretched and unprimed in my work. Also, the canvas changes its materiality when it is washed and dried. It looks and feels a little like bedclothes, and at the same time it reminds me at graffiti, landscapes, and old surfaces. Many of your paintings contain pastel colors. Is there a reason for this kind of color palette? Certainly I have my own favorite color palette, like most of us, but the washing process also decides what happens to the base coat colors. So, for sure, I am interested in those kinds of colors because they are washy and symbolize the past for me. In contrast, I use strong colors for my final intervention. Likewise, I observed that different colors react different to the washing process, but I try not to get influenced by this information. I think it is important that I am only interested in to making a good painting first, whatever that means to any of us! – and as a second step I have to destroy it. That’s part of the game, to erase something that you really set store on. After I finally paint notations on, I stretch them. This is a special moment for me, a little like a metamorphosis. In the end it becomes a painting AGAIN, telling you a story of trying to remember or misremember something. You mentioned your interest in keeping a calm studio. Do you also find your paintings to have this sort of calm to them? This is a difficult question. I’ve never thought of it that way before, but I don’t think so. I think I use this kind of calm or quiet to offset parts of my inner personality – whatever that means. I like the idea of surprise in your painting process being achieved by washing away the paint as an act of erasure. When did you start washing your paintings? I think I first started in 2012/13 with showering my paintings, but only for a short while because I got really frustrated about the control I had in this process. After that experience, I started washing my paintings with machines. Tell us a little about living as an artist in Berlin today and how this place has impacted your artwork. Berlin is, for me, the only city in Germany I want to live in. My decision to move to Berlin came nine years ago, and it was a practical one. Berlin was one of the cheapest cities in Germany with interesting immigrants/artists from all over the world and a lot of culture. So I moved to Berlin in 2006. It was a good decision, even if the rents are higher, and it’s overcrowded with artists now. Everyone is, or becomes, an artist in Berlin. Anyway, I got lucky, and Berlin has supported me with fellowships, culture, and an interesting art scene so I can become more and more professional in my work. I often ask myself if the city I am living in has impacted my artwork. I think maybe my preference for spray paint is due to Berlin’s street art stuff that I come across everyday. What I really love is that every hood in Berlin is different and has it´s own rules – Wedding (my working-hood) for example is strange but honest and makes me feel grounded. The market for contemporary painting has been very strong as of late. It’s becoming common to hear critics and artists alike saying that money is now influencing art to make it trendier or more easier to sell. Do you ever feel impacted by the market’s demands? 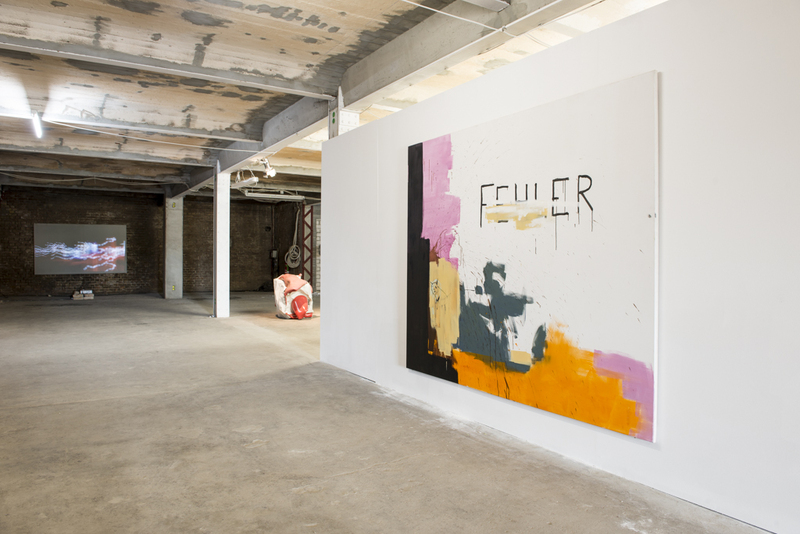 A large contingent of art critics are referring to contemporary abstract painting as “zombie formalism”. The most recent Venice Biennale focused heavily on conceptual art. As a contemporary painter, do you feel pressured or tempted at all to move into other art forms such as sculpture, video, and installation or are you dedicated only to painting? For me, it’s not interesting or useful to jump on a running train. Even if critics invent interesting neologisms for my kind of painting, it is not my job to think about something like that. I am painting. They’re writing. Everybody should do what they’re best at. To be focused on my work includes being honest with myself as well as with the material I have to use. So, if it would be important to use video or installation for myself and my artwork someday, why not? As an artist, you should have the freedom to do whatever you want, even if the market for contemporary painting has become very strong. I am a painter painting paintings. Please view Jenny Brosinski’s website and “like” Critique Collective on Facebook at http://www.facebook.com/critiquecollective. I really enjoyed this and hearing about her process. Great images, as well.